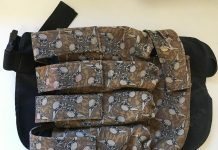 Various camouflage patterns made specifically for paintball and for other industries. 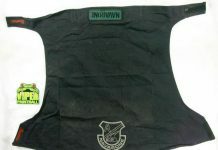 Here is a pack made by Indian Springs using the Sandana flying Skull print material. It's a 4 horizontal plus one vertical pack. 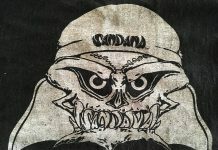 A look at the tag and silk screen designs on a very early Sandana head wrap with a printed tag and flying skulls logos. 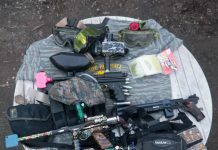 A table of misc paintguns and equipment that I'm preparing for videos tomorrow. 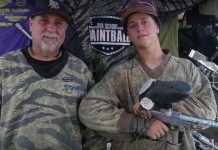 Frank Figerell, and his son Hayden, talk about Navarone and show off there impressive Navarone Autococker and Minicocker. 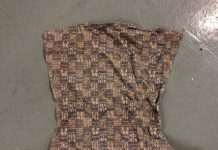 A neat Bad Bill Sandana head wrap with the hard brim and single tag and vintage pattern. Vents’ Head Armor c. mid 1990s? 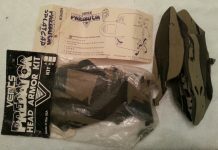 Two sets of vintage Vents' Head Armor from the mid 1990s. These attack to the top of a Vents mask. 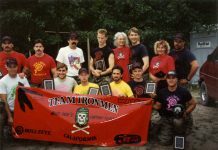 The Ironmen pose, at what was likely the 1991 Chicago Open. Photo was sent to me by Tim Schloss of Tiger Striper Products. 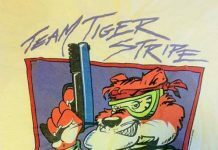 Here is a neat cartoon Team Tiger Stripe T shirt that Tim Schloss of Tiger Stripe Products sent me after I helped him reunite with his stolen bushmaster. Delaware Delta Dogs memorabilia c.1985-88? 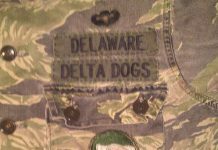 Dominic Michael Caputo II send these photos of his classic Delaware Delta Dog memorabilia, patches, paintguns, trophies and newspaper clippings. 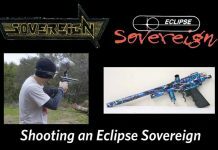 In this quick video I shoot and show off a very nice Planet Eclipse modified Sovereign 1. Two sets of Smart Parts / Renegade goggleflauge that I picked up a while back. 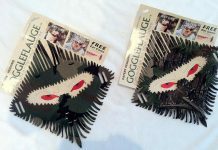 A neat additional to a mask, these will be listed on the site eventually. 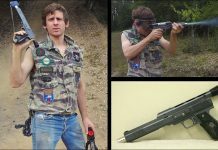 A Navarone Sandana that originally belonged to Navarone member Greg Durane and was given to me by Kerry "Viper" Rosenberry of Viper Scenarios. 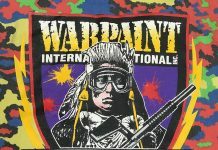 National Survival Games Hat c. mid-late 80s? 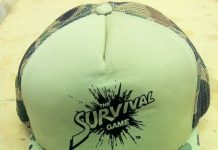 Awesome National Survival Game hat. 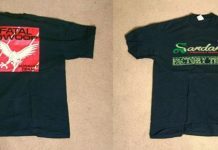 Camo with the silkscreened logo. 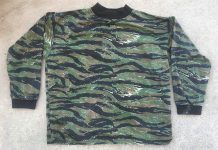 Not sure on year, probably 1987-1989?